Use Work Acknowledgement and Service Link to easily request Service Reviews. We have built NearbyNow's review platform right into ServiceTrade to make requesting reviews incredibly simple. 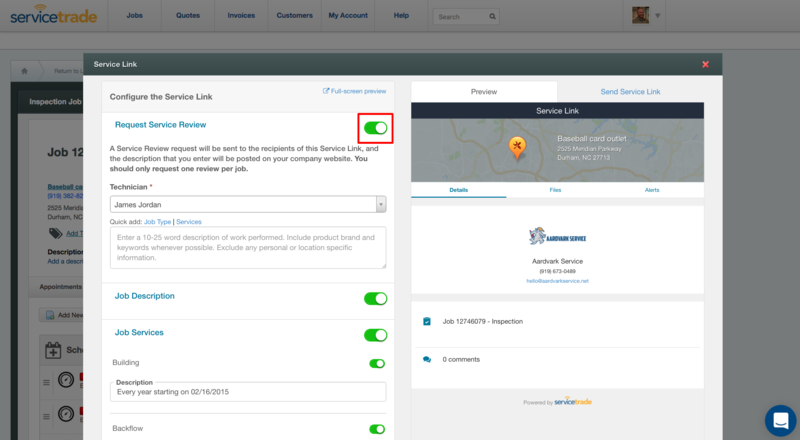 There are two places in ServiceTrade to request Service Reviews: Work Acknowledgement and Service Link. For technicians who have Service Reviews enabled, the following tutorial will briefly explain how easy it is to solicit a review from a customer. Service Review has been integrated into ServiceTrade in a way that makes requesting a Service Review a seamless step in completing the Work Acknowledgement. The "Request Service Review" toggle will be switched ON by default (for techs who have the feature enabled). Simply toggling this switch to OFF will ensure that a review request will not be sent to the customer. Techs can use the "Quick Add" feature to auto-fill their tech description, by selecting any of the blue buttons. This information auto-fills from the Job Page. The gray "Clear Description" button will clear the text in the description box. Note: The tech's description is no longer required to request a Service Review, however, if filled out, it will show up on your website along with the customer's star-rating and review comments. So while not mandatory, we highly recommend that techs enter something in this field. If you decide that you don't want to request a review, then simply turn the toggle to the OFF position. If you want your reviews to really shine, add a few words to the description field about the work performed. And that's it! Continue to complete the Work Acknowledgement as usual, and Service Review will take care of the rest! Simply toggle the "Request Review" switch. If there is more than tech on the job, select which tech you would like to request the review from. Enter basic information about the work performed. You may use the quick add buttons to copy the job or service info into the Review Request. Send the Service Link. The customer will receive a Service Link in one email and a Review Request as a standalone email. Service Link will warn you (but not stop you) if you have already sent a Review Request for this job. If there is any other doubt about whether a request was sent, check job history. If you just sent a request via Service Link moments ago, the job history may not yet be updated. You may need to revisit or refresh the job page after a few moments. Am I able to just do check-in without requesting a Service Review? No, we pair check-ins with review requests and send them over to the NearbyNow system together. Check-ins will show on your site right away (they aren't waiting on a review to be completed). Reviews will show once they are completed by the customer.